Crafted from poplar solids with cherry veneers and ash burl accents, this kneehole credenza and display hutch set boasts a layered, warm finish decked in traditional wood carving details like grape leaf carving and rope moulded case borders. Generous computer and office supply storage area is provided with a total of five drawers (top drawer includes felt lining), one of which is a convertible drop-front pull-out keyboard storage / pencil tray drawer. The left pedestal of the credenza offers two utility drawers and a locking file drawer that accommodates letter size files, while the right pedestal offers one utility drawer and a CPU, printer and/or scanner storage cupboard with an easy configuration area complete with case back access. The credenza also features a USB power hub and built-in power director to facilitate the use of all your electronics. The coordinating three-way touch-lit display hutch offers two lofted framed glass doors, each with an adjustable shelf, as well as an central open storage area with one fixed and one adjustable shelf. The Napa 72-Inch Kneehole Computer Credenza & Display Hutch with Three-Way Touch Lighting by Aspenhome at Gill Brothers Furniture in the Muncie, Anderson, Marion, IN area. Product availability may vary. Contact us for the most current availability on this product. 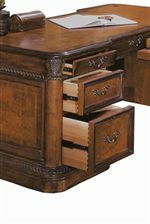 I74-322 Double Pedestal Desk 1 72" 26" 30"
I74-323 Credenza Hutch 1 72" 16" 54"
The Napa Collection presents elegant, old world styling for master suites and executive home offices. Enrich your home interior with the exotic, marble-look ash burl panel designs, highlighted grape leaf motif carvings and twisted rope moulded case borders featured throughout the Napa collection. The collection offers a wide selection of desk styles and storage accommodations to suit a variety of home office needs, any of which makes a handsome accompaniment to the leather upholstered, adjustable height office chair complete with nailhead trim and a caster base. 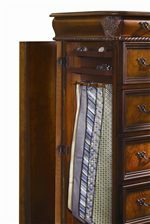 The bedroom collection encourages similar curatorial selection by offering ornately styled sleigh beds in queen, king and California king sizes, all available with or without storage drawers, as well as a selection of dresser and mirror storage combinations. 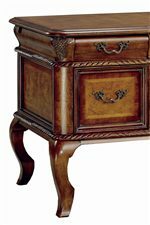 Create a luxuriously traditional and powerful style for your home office and master suite with the Napa collection. 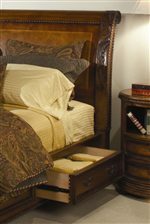 The Napa collection is a great option if you are looking for Traditional furniture in the Muncie, Anderson, Marion, IN area. Browse other items in the Napa collection from Gill Brothers Furniture in the Muncie, Anderson, Marion, IN area.